Five kindergarten classes enjoyed participating in a collaborative art project coordinated by Kindergarten Assistant Karen Perry. 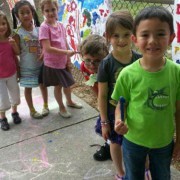 They displayed their art work outside the kindergarten classrooms. Toano Middle School is doing a spring spirit wear targeted toward rising 6th graders so they are able to start off the school with TMS tshirts, if they like. Students ARE allowed to wear these t-shirts to school on Fridays during the year, usually starting in October. We’ve arranged the sale through WmsbrgGrafix, where families may order TMS tshirts online, and they can visit http://wmsbrggrafix.com/product-category/toano-tigers/ to place orders. This sale ends May 29, at 5 p.m. There is a spot on the order form for families to delineate their current school and teacher, as orders will be delivered. We hope these shirts arrive before the last day of school, however, if something should arise, families will be notified when they arrive, and there will be at least a couple of times from which to choose to pick up orders.